I have a variety of succulents and cactus .. I am just still a bit stumped on the watering patterns because some are outside and some are inside depending on the space I have available. The soil I have them in is pretty porous and runs out fairly quickly when I give them a good watering so wasn't sure if that meant I need to water more often for that reason. I just notice some getting soggy and some getting brown and not sure how to tell when they need water. I know it's a loaded question but any help with that and what to try would be really appreciated!! I am learning. thank you! The trick with them is to get familiar with what the pot feels like when it's pretty much bone dry. I never water them if the soil is the least bit damp. Err on the side of no water if in doubt. Succulents won't wilt when they are dry. They will shrivel a bit, and look duller. They have adapted to withdraw from life if the conditions aren't perfect for them, so watering a little less often won't hurt them and they'll recover once you water them again. The soil should be pretty dry every time you water them. If the water runs out, and you think it hasn't allowed the soil to get wet enough, check it out by sticking your finger in, or get a probe that will tell you for certain. After a while, hefting the pot, if that's an option, will be enough. Get in the habit of doing that before and after you water so you know what it feels like. For cactus, their watering regime is a little trickier. Many of them have evolved to take up water when it's available, and they don't need it any other time. Some people have had great success with looking at the weather report from a similar habitat to where they evolved and only watering when it rains there. Then they might get one good watering every two years! They go dormant, which is essential for them to bloom. Too much water too often will rot them. Again, err on the side of caution. It also makes a huge difference if your plants, whether cactus or succulents, are planted in ground, or in containers, if they're shaded for some of the hottest part of the day, or not. 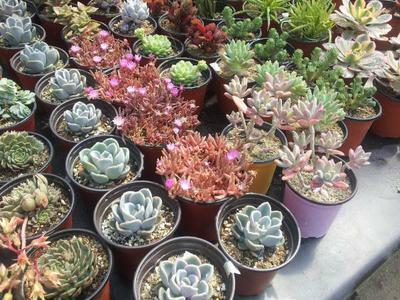 Your conditions will be totally different from any other grower, and there really are no exact rules for watering succulents correctly. Only time and experience (and the occasional death of a plant) will tell you. I really appreciate your response and advice. I haven't been able to find a better answer for this. All of my plants are in pots, so as far as I have been able to find, they may need to be watered more often for that reason. I will just have to try different regimens and trial and error for the soil they are in. How long should the soil stay moist in your experience? It seems to dry out within a few days. The weather report idea is very smart! I will try that for my cactus. Yes, you have to try different regimes. They are all different, including the size of the pot, and the size of the plant. The soil should DRY OUT. Not stay moist, at all. These are not ferns, or begonias. They NEED to be dried out, even if it's only for short periods of time. Be cruel to be kind.